In "The Five Manners of Death" there are five ways to die. Surgeon Diana Bratton believes that homicide is the only one left. Then the police prove her wrong. Diana learns that murder is her family secret. After a construction worker unearths a human skull on the campus of the University of Mississippi that dates to the 1960s, an older woman’s desperate attempt to erase history counts down the five manners of death. Surgeon Diana Bratton is surrounded by bodies after the discovery of her Aunt Phoebe’s 50-year-old note detailing the five ways to die. Suicide, accident, natural cause, and one death classified undetermined are soon crossed of this list—leaving Diana to believe that only homicide remains. Then the police prove her wrong. When Phoebe is linked not only to that death, but to the recent deaths of two local men, Diana is torn between pursuing Phoebe’s innocence and accepting police theory that her aunt is involved in multiple murders. Diana steals precious time from her young daughter, her surgical practice, and her hopes for renewed romance to clear Phoebe’s name. As Diana searches for evidence to outrun the conspiracy between her ex-husband and Phoebe’s long-time lover, her quest to expose the truth may be overshadowed by Aunt Phoebe’s need to rebury the past. What they're saying about my new novel coming June 15! "The Five Manners of Death is a taut, tense, and gripping tale about a long-buried secret tangled within the pages of an old college yearbook that once unleashed reveals that murder is a family affair. Meticulous plotting, richly-drawn and engaging characters, and a shocking storyline combine to create an extraordinary thriller rich in the unexpected. 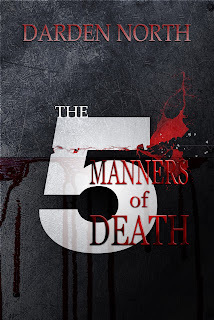 A unique but realistic story with the right mix of medical authenticity, The Five Manners of Death plunges readers deep into the minds of the novel’s characters as each learns that no one can be trusted—and that everyone has his own agenda. With this sensational, skillful, and highly suspenseful tale, Darden North claims a solid spot among today’s finest thriller writers." The novel, set in Jackson and Oxford, Mississippi, will be published by Wordcrafts Press in hardcover, paperback, and eBook and released June 15, 2017. Book pre-orders available online early March through your favorite retailer. ----- I look forward to seeing all my readers and friends soon at a book signing or other event!